An explosion inside a pyrotechnics company in Pleasant Hope, Missouri, the day before the Fourth of July, left one person injured. 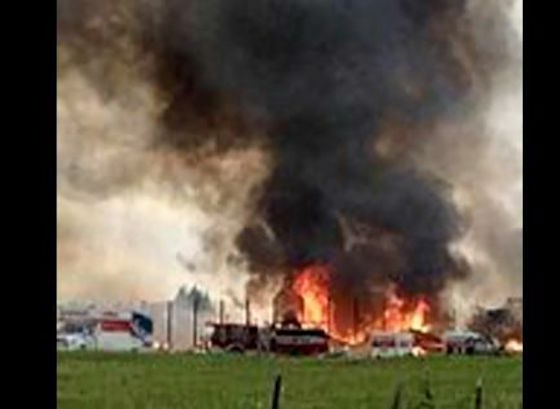 An explosion inside a pyrotechnics company in Pleasant Hope, Missouri, July 3, left one person injured. Samantha Dean, a young Springfield mother, suffered an injury in the incident. She remains in in stable condition after surgery Friday and she was scheduled to undergo another surgery this past weekend. As a result of the blast and ensuing fire, the state fire marshal’s office is investigating the blaze at the AM Pyrotechnics plant. The company is a fireworks wholesale retailer that provides pyrotechnics for big fireworks shows. Firefighters responded to a call of a fire at the business on July 3. As soon as firefighters arrived, explosions started. Firefighters said several workers had just left the building before the fire. The one injured employee is hospitalized. Smoke was visible for miles and neighbors said the explosion rocked windows. They said there was an initial boom and then smaller explosions followed. The fire destroyed much of the building. Bureau of Alcohol, Tobacco and Firearms (ATF) investigators said the inquiry is still ongoing. They are conducting interviews and combing through records. Ham said the ATF conducts inspections on firework manufacturers every three years. A.M. Pyrotechnics last inspection was in May 2017 and they were in compliance. During these checks Ham said they inspect the inventory, manufacturing process and even how the fireworks are stored.